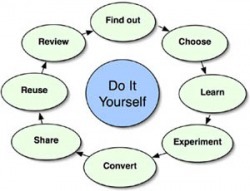 The DIY e-learning model assumes that if we want to utilise e-learning in our teaching practice, we do it ourselves. FIND OUT: There are many new e-learning tools, some freely available. But, we need to join e-learning networks, explore the internet to know where to find them and what they are good for. CHOOSE: We select the tools to suit our purpose and student needs. We select on the basis that it is small and doable, and horses for courses. LEARN: We find people who already know and have used the tools, seek mentors and participate where possible in professional development sessions. EXPERIMENT: We need time to adapt and experiment with the tools, to make mistakes and move on to something else if it does not work as we wanted. CONVERT: We use our pre-existing resource materials where possible, and convert them into a form that fits the e-learning tool. SHARE: We don't re-invent the wheel. We share our resources and our knowledge with other trade teachers who are discovering the e-learning pathway. REUSE: Once we have a resource that's suitable, we store and archive it, so that it can be reused at any stage in the future if relevant. REVIEW: We work in an ever-changing digital and trade environment, where today's solutions may not be tomorrow's.